Thousands of vacant buildings in Baltimore will be demolished over the next four years, city and state officials announced. BALTIMORE (AP) Thousands of vacant buildings in Baltimore will be demolished over the next four years, city and state officials announced, starting in the neighborhood where Freddie Gray was arrested and fatally injured in police custody, prompting civil unrest that highlighted the urban decay. Gov. Larry Hogan and Mayor Stephanie Rawlings-Blake said the new open space and state-subsidized financing will stimulate private investment in new homes, retail stores and other businesses to revive impoverished, crime-ridden neighborhoods. But as a bright yellow excavator tore into the first row house, some urban redevelopment experts and community activists said the program lacks a clear vision and firm plan for creating employment opportunities. Other large-scale demolition efforts, including those in Detroit, Cleveland and Youngstown, Ohio, have had mixed results, leading researchers to conclude that demolition may not be the best solution, said Katie Wells, a visiting scholar in George Washington University's geography department. The Baltimore plan includes $75 million in state funding to demolish blocks of abandoned buildings to create space for affordable housing, businesses and parks. The city will provide nearly $19 million worth of administrative services, and the state will offer more than $600 million in financing opportunities for private-sector development. The city of 620,000 people has about 17,000 vacant houses, concentrated in neighborhoods that saw rioting, looting and arson after Gray's death in April. In block after block in poor neighborhoods, former homes have doors and windows covered in plywood. Some of the boards are marked with signs about controlling the rat population, others with posters about the violence that took the lives of 344 people last year. “We must stop killing each other,” one says. The empty, brick row houses are often vandalized and sometimes catch fire. Rawlings-Blake, a Democrat who is not seeking re-election, said the program would accelerate the city's existing demolition plan, funded at $10 million per year. The program is dubbed CORE for “Creating Opportunities for Renewal and Enterprise.” The Maryland Stadium Authority will manage the demolition of buildings jointly identified by the state and the city. The first targets are the 40 houses in the 1000 block of North Stricker Street in Sandtown-Winchester, the West Baltimore neighborhood where Gray grew up and was arrested. Planners estimate that 20 blocks can be cleared in the first year. At that rate, 3,200 buildings could be torn down in four years. It's a smaller effort than Detroit's, which has razed about 7,100 vacant houses and auctioned off 500 more since May 2014. Detroit's plan intentionally avoids spelling out what happens after the bulldozers leave. Youngstown, Ohio, tried to retool itself into a smaller, greener city under a demolition plan launched in 2005. But John Russo, co-author of “Steeltown U.S.A.,” and a visiting research fellow at the Metropolitan Institute at Virginia Tech, said large-scale demolition hasn't had the economic impact planners expected. 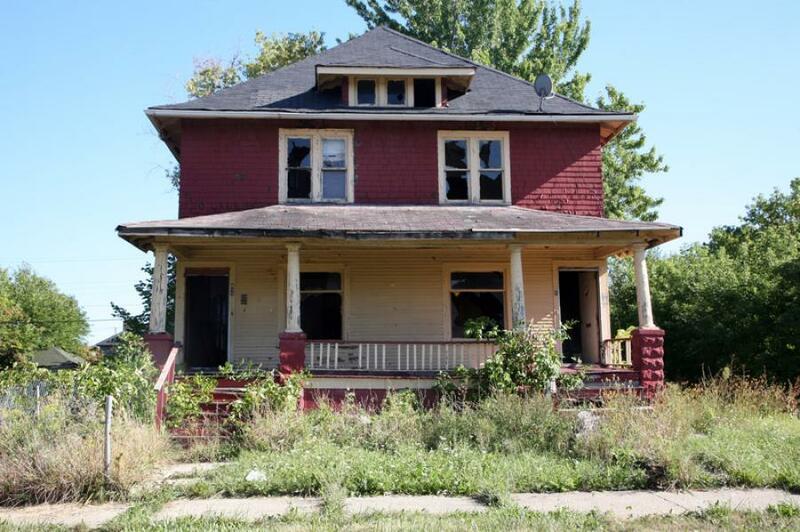 Russo and Wells said reusing vacant houses — by selling them for a dollar, as in Buffalo, N.Y., or offering them as cheap housing for refugees or recovering addicts — may be a better way of creating or sustaining communities. The Rev. Andrew Foster Connors, co-chairman of Baltimoreans United in Leadership Development, said his group has tied its neighborhood redevelopment projects to entry-level job creation for people with criminal records, largely for low-level drug crimes, by working with nearby employers including Johns Hopkins University. “Any kind of redevelopment work, I think, has real potential, but it's got to be paired with job creation — programs that connect real jobs with people who need them,” Connors said. Hogan said he's sure the jobs will come. “Tearing down these buildings doesn't directly and immediately bring in jobs, except for maybe some demolition jobs taking the building down, but cleaning up the neighborhood is going to make more people want to invest and do more projects here,” he said.